As Rick Stafford highlights, plastic pollution is only a part of the problem that we face today. It is one of the reasons why we currently face a huge environmental crisis : climate change. Something incredible is happening in France : 4 NGO published a petition to attack the French State. Notre Affaire à Tous (Everybody’s concern)), la Foundation pour la Nature et l’Homme (Nature and Mankind Foundation), Greenpeace France and Oxfam France joined forces to call on the French government about its inaction on the climate matter, aka for failure to fulfil its obligations. As a matter of fact, France committed to make important change in its action for the environment and climate change. Among those : the Paris Agreement, for which France was a leader. According to this agreement, France was supposed to reduce its CO2 emission to 2%. But in 2018, the country failed to his objective by 6% ! Not a great success for a country that wants to “Make our planet great again”, and be a figurehead for a positive change. 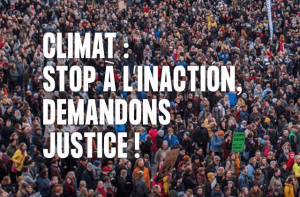 Climat: Stop A Linaction, Demandons Justice! The online petition was published on December 17th and in less than 48H, it gathered 1 million signatures ! On January the 3rd, 1.9 million people had signed the online document. A YouTube video featuring famous French people – such as Marion Cottillard, Juliette Binoche, Elie Semoun, Shaka Ponk and many others – was relayed on social media. This kind of action is not unprecedented : French people are not the only ones attacking their government in justice. Other citizen of various nationalities took action too : in Pakistan a farmer named Ashag Leghari went to trial against his government in 2015. He accused it to not do anything against the climate change that affects food and water supply. He asked the judges to defend the right to a decent life and human dignity written in the Constitution. Ashag won the trial, and the creation of a Climate Change Commission inside the government was ordered. Another example is Columbia in 2018. 25 citizens and the NGO DeJusticia attacked the State to save the Amazon Forest. They won, and the Columbian Supreme Court gave ( months to the government to put a plan together in order to stop deforestation. Again, in the United States of America in 2015, about twenty teenagers went to an Oregon courthouse wanting to significantly decrease the CO2 emissions. In may 2018, 10 European families attacked the European Union in justice to call it on its lack of action in favour of regulating climate change. Dutch people also took action against Netherland, and won. The country was condemned to reduce its gas emission by 25% instead of the 17% intended by its government. What is unprecedented however is the magnitude of this action. Netherland won, with one NGO called Urgenda and the support of 900 Dutch people. France has way more supporters, the question is now : will that be effective? In 2018, the charity Plastic Tide put online an interactive map, meant to localize plastic trash on UK’s beaches. For that, the charity took drones pictures of the coast, and is asking the public to help by tagging the kind of plastic detritus they see. You can access this map by clicking here. The oceans and seas represent 70% of the Earth’s surface. This added to the meteorological conditions and marines currents allow the plastic to travel quite far from the place it was released into the ocean. It is well-known that plastic pollution is a problem, with its invasion of the oceans. It has gotten to the point that the Ellen MacArthur Foundation revealed in a study that in 2050, there could be more plastic than fishes in the oceans (in terms of weight) ! Actually, the equivalent of one garbage truck is dumped into the ocean every minute that goes by. This number could rise to two garbage trucks per minute in 2030, and even four in 2050 ! It is difficult to imagine the journey a plastic detritus can make. Erik van Sebille, a researcher of the Utrecht University, specialised in the study of the worldwide circulation of the ocean and its effect on climate change tried to answer this interrogation. He created a statistical map to help visualize the itinerary a single plastic garbage can follow when dumped in the sea. Here we can see that a plastic detritus originating from the south coast of England could spread all the way to central America in 4 years and six months, covering a wide surface due to its decomposition into microparticules. And we know plastic can take a thousand year to decompose, so it has to time to spread all over the ocean in a global scale! Here is some extra footage of waves of rubbish floating in Caribbean Sea.